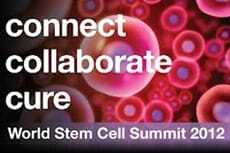 On December 4, NYSCF CEO Susan L. Solomon was honored at the World Stem Cell Summit with the 2012 Stem Cell Action Leadership Award. Annually since 2005, the Genetics Policy Institute has recognized the achievements of scientists, activists, organizations, and philanthropists who have contributed to stem cell research. Past awardees include Michael J. Fox, Sherry Lansing, and former Michigan Governor Jennifer M. Granholm. In addition to Ms. Solomon, 60 Minutes, the Alliance for Regenerative Medicine, the Nebraska Coalition for Lifesaving Cures, and Sabrina Cohen, received Stem Cell Action awards for their achievements.